Happy Saturday, everyone! Today, I have for you three of the new Tranzitions shades from China Glaze! The Tranzitions are a form of color-changing polish in which the use of top coat triggers the color shift. 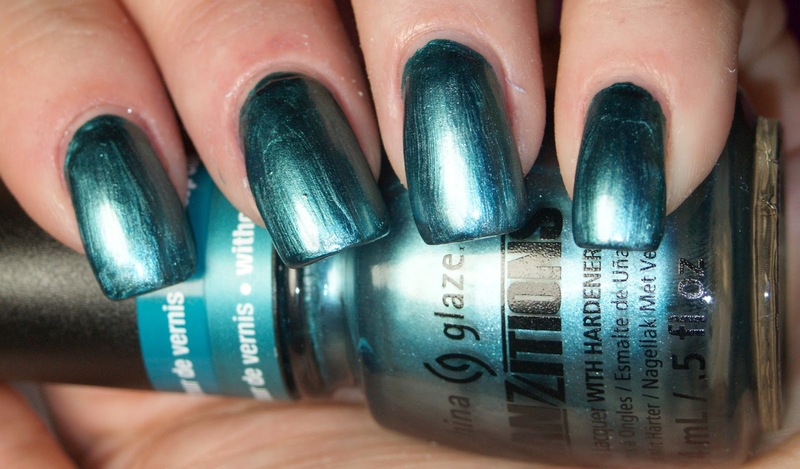 In all of the swatches with the dual colors, I used China Glaze Fast Forward top coat. 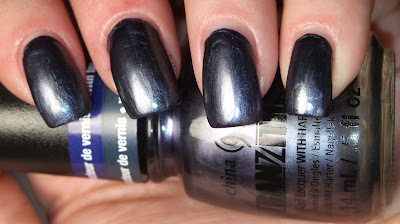 First up is Shape Shifter, a gunmetal metallic polish. This was opaque in just one coat. The color itself was pretty, but very streaky. I did my best to hide the brushstrokes, but I wasn't thrilled with the end result. 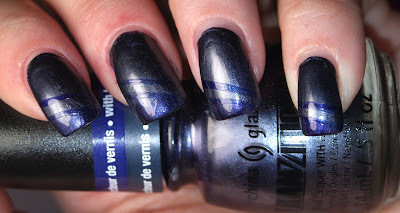 Here is Shape Shifter with the top coat. I wanted to do some designs on the nail so you could see the difference with and without top coat. As you can see, the color shifts to a blurple that I'm pretty fond of and would probably wear on its own. 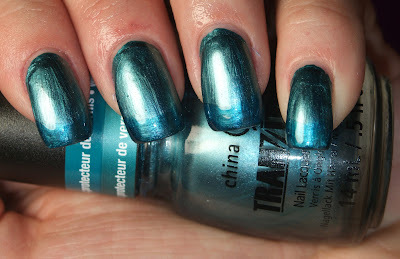 This one is Altered Reality, a teal metallic polish that was opaque in one coat. This was even more streaky than Shape Shifter. The french tip I did was with two coats of top coat and it barely made a difference. The shift wasn't enough to be noticeable for me. This was by far my least favorite of the three. Split Perso-nail-ity was my favorite of the three and probably the only one I'd wear again. It's a dusty pink that changes to more of a magenta. This is with two coats to even out the streakiness. And here is the color with the top coat. I used a dotting tool to create the polka dots and then dotted the original color back on to hollow them out. I thought this was a pretty easy way to do nail art. The pros: Versatile color. Need only one bottle for multiple looks. The cons: Slow dry time unless you use a top coat, but you can't if you want any portion to remain pink. These shades also stained my nails. Additionally, the brushstrokes are not really attractive to me in the first two shades and not nearly enough of a color shift. The Tranzitions collection is currently available at ULTA and other beauty retail stores. For more information, please visit www.chinaglaze.com or follow China Glaze on Facebook (@ChinaGlazeOfficial), Twitter (@ChinaGlaze) and Pinterest (pinterest.com/chinaglaze). What do you think of the Tranzitions? Do you have a favorite?